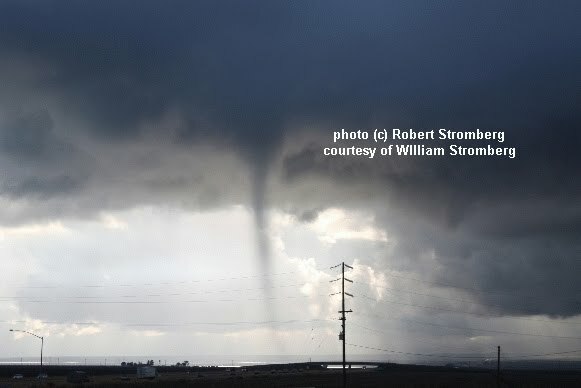 My friend composer/conductor William Stromberg (who also storm chases with his wife Anna Bonn) sent me the cool photos above taken by his brother Robert Stromberg (production designer and Oscar winner earlier this year for the film Avatar) yesterday morning while driving on Interstate 5 near Bakersfield, California (about 90 miles north-northwest of Los Angeles). These came out of some very low-topped convective showers associated with a potent upper storm system but limited instability, so I thought the setting was worth a look. The 500mb forecast during the day on 11/8/10 (see 3rd image above) showed a strong upper trough (heavy black dashed line) moving across California and Nevada. Although a surface cool front (not shown) associated with this trough had already moved through the area, there was just enough moisture (surface dew points in the upper 40s F) and cold air aloft for a little sun-driven surface heating to pop some small showers (see satellite image above) in the Bakersfield vicinity, aided by forcing from the upper system. A RUC model analysis sounding estimate for Bakersfield (BFL, see last image above) at around 16 UTC (8 am PST, near the time of the funnels), indicated a small pocket of CAPE/instability (possibly under-estimated by the RUC model) at around 3000 ft above ground, which is very near the surface. 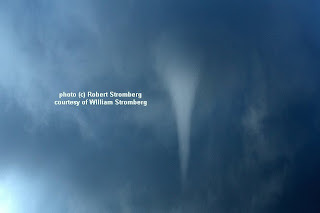 Apparently, enhanced stretching with the CAPE pocket so close to the ground, a steep lapse rate below cloud base, and the strength of the upper system combined to generate these "cold air" funnels within the updraft columns of 1 or 2 of the low-topped showers. As you can see, you don't always need alot of instability to get interesting things to happen with some fall and winter systems moving across southern and central California. I didn't see any funnel or tornado reports online with the National Weather Service, so it may be that Robert was the only one to photograph these funnels. Many thanks to Robert and William for sharing these photos of an event that would otherwise have probably gone undocumented!